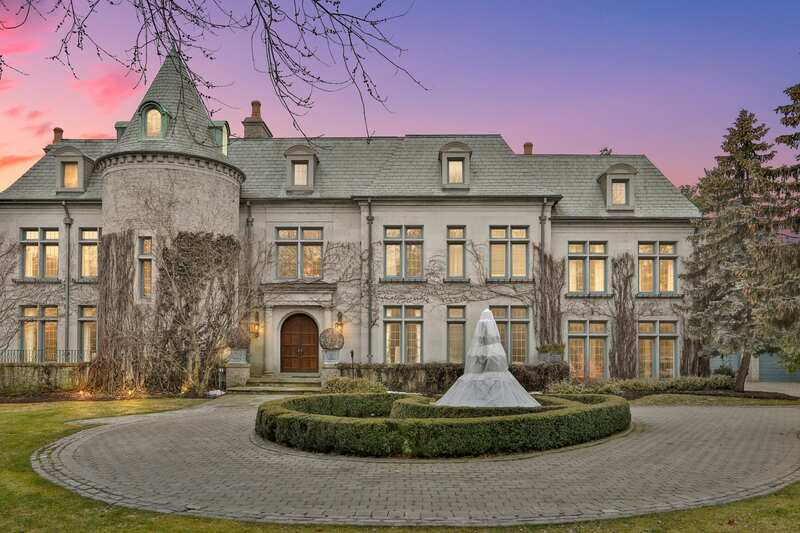 Exquisite French Provincial Chateau Nestled On The City's Most Prestigious Street-The Bridle Path. Exuding Grandeur & Elegance. Classic Landmark Residence Crafted By Joe Brennan & Its Proud Owners. 2 Aces Private Oasis With Pristine Manicured Gardens, Pool & Professional Sport Court. No Detail Overlooked. Over 15,000 Square Feet Of Living Space. Stone & Wrought Iron Gated Entry. Cathedral Beamed Grand Foyer. Timeless Architecture. Leaded Windows. Multiple Open Hearth Fire Places. Walkout To Gatsby-Like Terrace. Solid Oak Doors Throughout. Soaring Ceilings. 3rd Level Recreation Floor With Billiard Room And Indoor Hockey Rink. Gourmet Kitchen With Pantry And Rotunda Breakfast Area. Formal And Opulent Principal Rooms. Intricate Ceiling Mouldings And Mill Work. Main Floor Paneled Library. Pool House With Change Room And 3-Piece Ensuite. Separate 2 Bedroom Apartment Above Garage. "Pristine Manicured Gardens, Pool & Professional Sport Court." Heated Walkways, Stone Floors And Ensuites. The gourmet state of the art Kitchen, entered through an archway off of the Butler’s Pantry/ Servery and Foyer and open in design to the Breakfast Area, features heated terracotta tile floor, built-in speakers, crown molding, pot lights, pendant lights, custom designed and crafted solid wood framed cabinetry, double stack cabinets, recycling and garbage pull out drawer, granite countertops, tumbled marble backsplash, custom ceiling design, under valence lighting, professional hood fan with wood canopy, a recessed paneled archway leading to the Service Hall, custom built-in desk area, a French door walk-out to the stone terrace and gardens, several glass front display cabinets, a stainless steel under mount sink and an expansive center island with a built-in Breakfast bar and two additional under mount stainless steel sinks. The Library, entered through a pair of double solid wood entry doors off of the Foyer, features wide plank quarter sawn white oak hardwood floor, crown molding, pot lights, decorative ceiling molding, floor-to-ceiling recessed paneled walls, floor-to-ceiling custom built-in bookcase comprised of open display shelving and closed cabinets, an open hearth gas fireplace with a carved marble mantle and stone hearth, floor-to-ceiling leaded windows outfitted with custom Hunter Douglas blinds overlooking the rear gardens and a French door walk-out to the stone terrace and gardens. The Upper Hall features the focal point of the home, the stone turret with stone walls and wrought iron hand rail. The Upper Hall also features leaded windows overlooking the front gardens, access to the service staircase, a double linen closet, stairs leading to the Third Level, domed cathedral ceiling with dramatic wood beams and a hanging chandelier, recessed paneled archways, textured wall treatment, crown molding, pot lights, light sconces, and wide plank quarter sawn white oak hardwood floor. The Master Bedroom Suite, entered through double doors, features crown molding, pot lights, wide plank quarter sawn white oak hardwood floor, built-in speakers, designer wall treatment, custom built-ins comprised of closed cabinets and open display shelving, a gas fireplace with a decorative precast stone mantle and a French door leading to the stone balcony overlooking the rear gardens. The Master Bedroom also features a fabulous rotunda style Sitting Room with a domed beamed ceiling, chandelier, crown molding and an array of windows outfitted with custom drapery overlooking the rear gardens. The 6-piece ensuite bath, entered through a pair of solid wood doors, features a heated marble floor with contrasting marble inlay, pot lights, crown moldings, a frosted glass door leading to the water closet with a toilet and bidet, a seamless glass shower with a marble surround, stationary faucet, soap shelf and built-in speakers. The ensuite also features separate “His” and “Hers” custom vanities with marble countertops and under mount sinks, light sconces, custom framed mirrors, floor-to-ceiling leaded windows looking out onto the Balcony and gardens and a French door walk-out to the Balcony. Her Walk-in Closet features wide plank quarter sawn white oak hardwood floor, built-in speakers, a chandelier, pot lights, crown molding, leaded windows outfitted with custom drapery overlooking the rear gardens, ample storage, custom built in cabinetry, custom shelves, pull out drawers, shoe racks, custom purse storage and an integrated mirror. His Walk-in Closet features a wide plank quarter sawn white oak hardwood floor, pot lights, crown molding, leaded windows overlooking the rear gardens, a light fixture, custom built in cabinetry, custom shelves, pull out drawers, shoe racks and ample hanging storage. 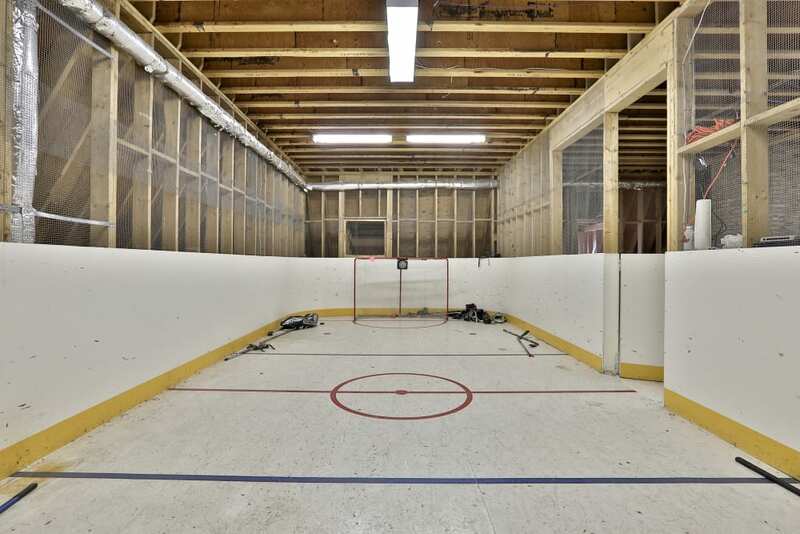 3rd Level Recreation Floor With Billiard Room And Indoor Hockey Rink.